Canvas lace up shoes are a perfect companion to see you through the summer – and they’re also fantastic for the winter, too. 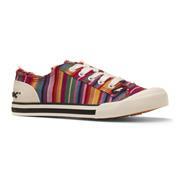 With their tightly-woven fabric exterior, they’ll allow your feet to breathe while providing that crucial canvas chic. Included here you’ll find an extensive variety of different sorts of shoe. There are white canvas lace-up shoes, alongside more elaborate floral patterns that are certain to catch the eye. Any of the designs here, from the classic to the contemporary, will make a great match for an upcoming beach holiday – and they’re sure to see much wider use than that, too! 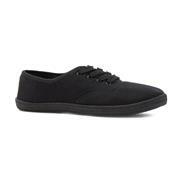 Part of the enduring appeal of lace up canvas shoes for women is their versatility. 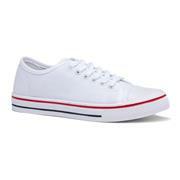 They’re sure to look great on women of all ages and fit well with a variety of outfits. Whether you’re sporting a pair of jeans or a skirt, canvas has the answer. What’s more, it’s almost guaranteed to never go out of style. 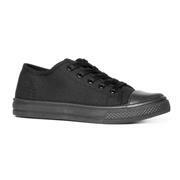 Like all of the shoes we sell, our canvas lace up shoes provide exceptional quality at affordable price points. What’s more, you’ll get free standard UK delivery on all orders. So what are you waiting for? Why not pick out a pair today? 17 products from £4.99 to £39.99.